Preheat oven to 350 degrees. Discard the outer leaves of the cabbage, and blanch the inner leaves until tender, about 10 minutes (the water need not be salted). Put the cooked leaves on paper towels to cool and dry out, then line a nonstick oven-safe frying pan with the leaves. Saute the leeks and onions in the oil over medium heat until tender. Add the spinach. Season with salt and pepper to taste. Continue to cook until the spinach has begun to wilt, then drain the vegetables in a colander. Blend the eggs, cream, cheese and nutmeg, season with salt and pepper to taste, and fold the mixture with the drained vegetables. Carefully pour it into the cabbage-lined pan. 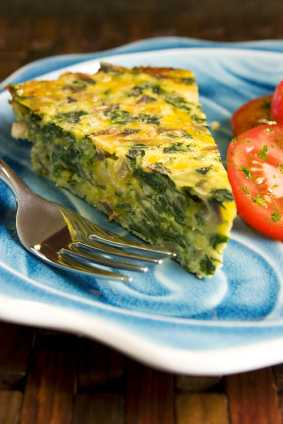 Bake in preheated oven for 25 to 30 minutes or until the quiche is firm to the touch. Allow it to rest for 10 minutes before serving.